You might remember Tailpipe.co from a few months back. It lets you search across a range of sites to find classic cars, and it promptly obliterated our productivity. But it left a bit to be desired, so after hearing our gripes they're relaunching at VintageWheels.com. We're the first to get a taste and your afternoon is officially toast. The new site is currently showing nearly 70,000 cars across 1,500 makes and models, and covers the U.S. and 50 other countries. It's pulling listings from a variety of sites, including eBay Motors and mobile.de, and it's adding new sources every week. The man responsible for annihilating hours from your life is Jason Davis, a PhD in data mining and ex-Googler who had his last startup acquired by Etsy. 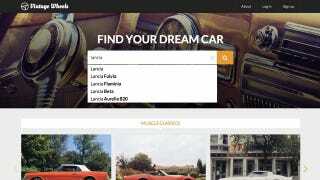 "Data is core to us, and our goal is to build the most complete catalog of high quality classic cars on the web," Davis says. That data-driven sourcing means that things like eBay auctions are updated in real-time, with current asking prices and the ability to toggle between local currencies. But it's not just about feeding the beast through algorithms. "We're data guys by trade, so we try to do as much as possible algorithmically," Davis told us. "We also have a human curation component that we'd like to open up to the community sometime in the not-too-distant future." The site is live and we're already scouring it for vintage Alfas, unloved BMWs, and… oh god, the Fulvias. All the Fulvias.